Heinkel He177 A5V2 medium/heavy German bomber, full moving parts, excellent paint scheme, included weapons package including Henschel rockets and 5000-lb bomb. Beautiful panel and cockpit, sounds, and readme insctuctions included. Heinkel He 177A5V2 medium bomber with Henschel Rockets included. So far as detail and sheer fun of flight, this aircraft takes the prize. The bomb bay doors open and close with the "D" or the"/" key, depending on keyboard layout. Not only does this plane use the Henschel rocket but it can carry a 5000lb bomb as well as twin torpedoes. 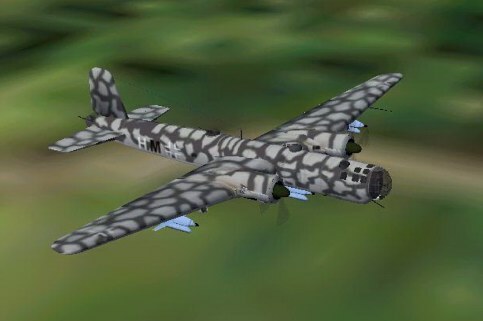 In the original designers readme he urges us to remember this is a bomber! It flies so well that you can often try to make impossible manoeuvres in this aircraft. Make your approaches like any other bomber. Special thanks from Greg Law for his generous permission for me to use his aircraft.